Hair dryers were all the rage among men in the 1970’s, 80’s, and 90’s because hairstyles demanded it. If you wanted to achieve a specific look, the road to getting there including drying and brushing your hair. The past couple of decades has seen the demise of the blow dryer, however. Shorter hairstyles, even public opinion – helped relegate the dryer (for men, that is) to bin that included VCRs and bell-bottomed jeans. While they never disappeared entirely, hair dryers have re-emerged because of changing hairstyles. 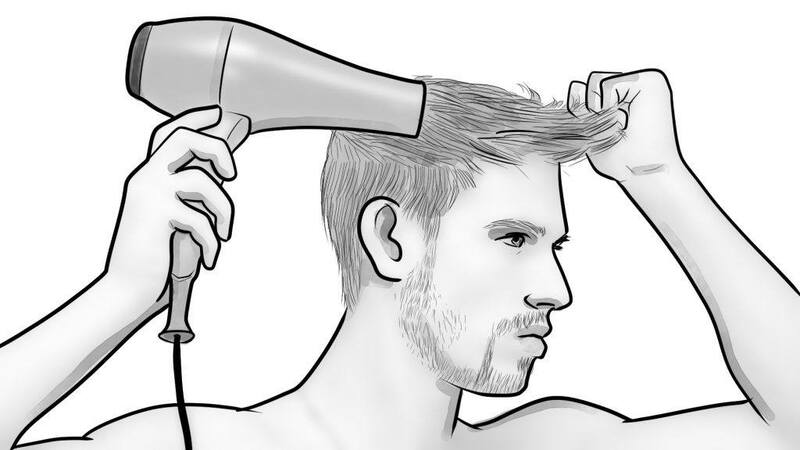 Many of today’s men include the use of a top-quality dryer – such as the Dyson Supersonic Hair Dryer in their morning routine without shame. And why not? 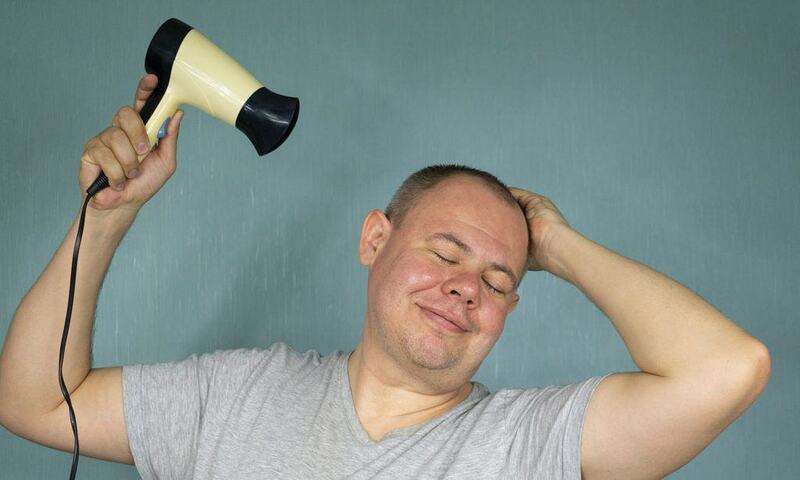 A hair dryer for men is simply another tool to help you look your best, day-after-day. 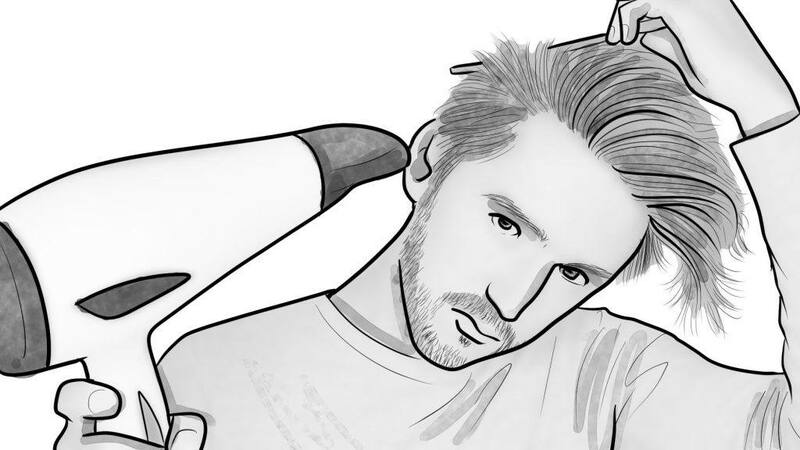 We’ll look at the best blow dryers for men, as well as plenty of other information about them, in this post – including what to look for when buying them and how to use them properly. You need the right tools for styling your hair, and a quality hair dryer is one of those tools. Not just any hair dryer, mind you, but one that’s best suited for your type of hair and one that won’t 1) damage your hair, or 2) leave it looking less than its best. Power comes down to wattage and the higher the wattage of a hair dryer, the more heat it generates. And, of course, the more heat, the faster you’ll dry your hair. Most hair dryers are 1,300 to 1,850 watts. You need a dryer with more wattage if you have thicker hair, but for most people the standard wattage is sufficient. Just a note: Cheaper hair dryers tend to have lower wattage. Not only won’t you dry your hair as fast, but they’ll also wear out sooner than more expensive dryers. Unless you’re looking for a good bicep and forearm workout away from the gym, you’ll probably prefer a lightweight hair dryer. A lighter weight blow dryer is easier to hold and won’t fatigue your arms as you dry your nice, thick locks. Temp control is a key feature of any dryer and it regularly measures the air temperature and adjusts it to protect your hair from heat damage. Many top-quality dryers come with multiple heat settings, such as low, medium, and high. If you have fine, thin, or dry hair, a lower heat setting works best for you. If you have normal hair, the medium heat setting is ideal. If you have coarse, thicker hair, use the high heat setting. Look for a hair dryer that has a cold air button that releases a blast of cold air. The colder air helps you to “set” your hairstyle. Touch cool technology keeps the surface of the dryer and its attachments cool. Diffusers help lift and separate hair to boost its texture. They also help dry your hair quickly without messing up its style. Finally, they reduce frizz. It’s a bonus if your dryer comes with a swivel cord that prevents it from tangling. If you’re like a lot of hair dryer users, you understand the frustration of a cord that becomes knotted and twisted every time you use it or every time you set it down once you’ve finished drying your hair. Some dryers come with a mount that you attach to your bathroom wall for easy storage. Some mounts even come with a night light. In any case, it’s a good idea if you have limited storage space, or if you always want to know where you last put your dryer. Some dryers come with an attachment such as a concentrator nozzle that snaps on to the end of your dryer (like a diffuser). As its name implies, a concentrator nozzle emits air in a concentrated stream that helps straighten your hair, if so desired. Make sure that you the follow the path of your brush as you’re drying your hair, and never let the concentrator nozzle come into contact with your hair. Some dryers come with a comb or hair pik attachment that snaps to the end of the dryer, much like a concentrator nozzle or a diffuser. A comb or pik attachment is helpful if you have thick hair or curly hair because it helps stretch out the natural curl pattern when drying your hair. Plastic or metal dryer housings coated in ceramic or porcelain provide heat that’s less harsh and more consistent. That makes them good for fine or dry hair that loses moisture easily. But a ceramic or porcelain model is suitable for all hair types and a good choice if you’re not sure what type of dryer to buy. Titanium dryers provide heat at an even, steady temperature. That temperature, however, can get pretty hot, so titanium isn’t a good choice if you have fine or damaged hair. A tourmaline or ionic hair dryer gives off negative ions that break up the water droplets on your hair for faster drying. It’s your best option if you have thick or frizzy hair or any hair that’s difficult to dry. (Tourmaline, by the way, is a semi-precious metal that provides the most intense ionic action. OK, now that we’ve covered some hair dryer buying tips, let’s move on to our product reviews and the best hair dryer for men. Dyson initially made its name with its futuristic vacuum cleaners but has bolstered its strong reputation thanks to its hair care products. Dyson is serious about it; they reportedly invested over $70 million into their hair dryer line. Dyson’s Supersonic Hair Dryer proves that it’s money well-spent. It not only looks good – albeit a bit different than other dryers – but its performance is also second-to-none. 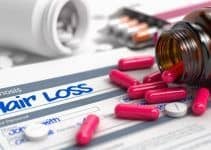 Why do we include it on our list? For starters, it’s the best hair dryer for frizzy hair because it generates a powerful airflow that allows you to dry your hair quickly. For folks with frizz, that’s good news because they don’t want to expose their hair to high heat for a long period. The Dyson Supersonic also includes buttons that let you adjust the heat level and airflow. The Dyson Supersonic comes with a diffuser that, like all of the attachments on the Dyson Supersonic Hair Dryer, connects to the dryer housing automatically – a very handy feature, indeed. Other features include a smoothing nozzle, a concentrator, and a button that provides a cool burst of air. We also like that the Supersonic is lightweight and comes with a longer-than-normal cord that allows you to move around freely as you dry your hair. The dryer housing is smaller than on many other dyers, making it suitable for travel since it fits easily into a small suitcase or overnight bag. Again, one of the selling points of the Dyson Supersonic is the powerful airflow it generates, but it’s easily adjustable so that you can get a low volume of air and consistent heat. It comes with four heat settings and three airflow settings, as well as an ionizer and a removable filter at the bottom of the dryer that notifies you when it needs cleaning. Here’s something else about the Dyson Supersonic: the motor is actually in the dryer handle, which balances the weight better than other dryers while causing less arm fatigue. Last, but certainly not least, it comes with a two-year warranty on parts and labor. The Dyson Supersonic is another step forward in the evolution of hair dryers and one worth checking it out if you’re serious about having the best grooming tools. Think of a car that has more than enough horsepower yet can handle corners and city streets without flying out of control. In some ways, that describes the MHU Professional Salon Grade 1875-Watt Hair Dryer. The 1875 is powerful, with a motor capable of reaching 1,875 watts yet has little vibration and is quieter than many other dryers. Far-infrared heat combined with negative ion technology enables users to dry their faster while eliminating frizziness and the risk of damage. What is far-infrared heat? It’s infrared light that diffuses gentle, healthy heat into the core of the cuticle, and not just to the surface of the hair shaft like most blow dryers. It comes with a bonus diffuser that supports the curls in your hair, making it the best hair dryer for curly hair. The MHU 1875 comes with two speeds and three heat settings that enable you to control the airflow and the amount of heat. It comes with an airflow concentrator that helps accelerate drying while adding volume to your hair without adding frizz. A 9-foot cord allows you to freely roam while drying your hair and comes with a hook that makes storage simple. The cord is also heat-proof. The MHU 1875 includes a cool-shot button that releases cool air to help lock in your style quickly and easily. A removable lint filter makes cleaning the dryer easier while offering the kind of simple maintenance that extends the life of your dryer. The motor is powerful enough that you can dry your hair in half the time, even while using the cool air setting. Minimal vibration helps make the MHU 1875 easy to handle. The MHU is a robust, versatile dryer that comes with a reasonable price tag. It handles easily, comes with a variety of attachments, and is a strong option if you have thicker or curly hair. We’ve all experienced those mornings where getting out the door on time is about as easy as climbing Mt. Everest in a T-shirt and sandals. We rush through everything, including drying our hair and leave the house a bit unprepared. “Unprepared” includes hair that’s still too damp. The outside may be dry, but what about the hair closer to your scalp? And maybe it has nothing to do with being in a hurry but everything to do with your hair dryer. In either case, the Andis 1875-Watt Tourmaline Ceramic Ionic Styling hair dryer resolves that issue thanks to its high velocity and ion technology. The latter involves releasing negative ions that break water molecules into smaller pieces that evaporate faster. Meanwhile, the 1875 watts of velocity sends air to the deepest layer of your hair to help dry your hair evenly. Made of ceramic, the Andis 1875 provides even heat that preserves the natural oils of your hair and scalp while sealing in moisture. It makes your hair more manageable and is the best hair dryer for fine hair because of the manageability it offers. There are plenty of other reasons why we include this dryer on this list. It comes with three air and heat settings to help you control the drying process, including a turbo-boost high-speed setting. The Andis 1875 also comes with a cool-shot button to help you lock in your style with a quick burst of cooler air. We also think it’s the best men’s hair dryer with a comb because the Andis 1875 comes with three comb attachments – a soft brush, a fine-tooth comb, and a wide-tooth styling pick, all of which help you achieve your desired style. The boar bristle brush attachment promotes better scalp circulation and even distribution of natural oils. We’ve talked of boar bristle and boar bristle brushes in previous posts; they’re the real deal and work like magic on beards. A couple of other things we think you’ll like about the Andis 1875 are that it’s lightweight and that it has worldwide dual voltage if you do a lot of traveling outside of your home country. The Andis 1875 represents a great option for men on a tight budget but it’s lower price tag doesn’t indicate a lack of quality. 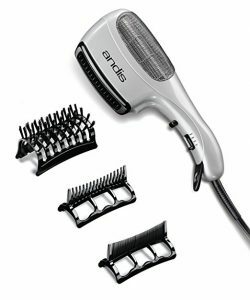 You’ll like its powerful airflow, its adjustable settings, and the versatility provided by its three comb attachments. Remington is all about innovation, including in its line of hair dryers. They also rely heavily on the advice of salon professionals before designing hair styling products that actually work. The AC2015 T demonstrates Remington’s commitment to staying ahead of the game thanks to a variety of features that makes it among the best hair dryers for men. For starters, it comes with an 1875-watt motor that makes for faster drying time – 40% faster, says Remington – but one that’s durable and should last you a long time. The ceramic design improves heat distribution while maintaining a constant temperature. That means the temperature will stay the same without fluctuating while using either of the dryer’s three heat settings. The AC2015’s powerful motor makes it ideal for people on the go. The patent-pending ceramic houses micro-conditioners that are activated by the heated airflow and the micro-conditioners are transferred to your hair and seal its cuticles for a silky-looking sheen. You’ll like that the AC2015 comes with a variety of styling tools – including a concentrator that’s ideal for straighter styles, and a diffuser that helps style curly and wavy hair. It comes with a cool-shot setting and two speeds that also help you to create different styles. It has an ionic generator that’s another professional-grade feature on an affordable dryer meant for home use. The Remington AC2015 is a professional-grade hair-grooming tool for use in the home. The motor is more powerful than most other dryers, while it’s easy to manage the amount of heat you need during the drying process. You’ll notice the word “ionic” a lot when researching the best hair dryers for men. In this case, ionic means technology in which dryers emit negative ions that cause drops of moisture on the hair to divide into smaller particles. In turn, hair-drying time lessens as the smaller drops of moisture dry faster. And the less time your hair spends under the hot stream of air from your dryer, the less frizzy (and less damaged) it is. It also means that you can use a lower temperature to dry your hair, which prevents damage, as well. The Conair 1875 Full-Size Pro Hair Dryer includes ionic technology that dries hair evenly and, at least in theory, makes it easier to create your preferred hairstyle. It comes with a hairdryer concentrator/nozzle for pinpoint styling. The Conair 1875 dryer also utilizes Tourmaline Ceramic technology that provides more uniform heat – and, again, faster drying with less potential for damage. Tourmaline is a semi-precious mineral that generates only negative ions when heated, and when used in hair dryers is said to dry up to 40 percent faster than other dryers. So, if nothing else, the Conair 1875 promises a faster drying experience. But there are plenty of other reasons to buy it, including that it comes with three heat settings and two speed settings that provide greater control and the ability to work with different types of hair. It also comes with a cool-shot button that’s utilized to help lock your style in place when you’re almost finished drying your hair. You’ll also like how easy the 1875 is to handle thanks to a no-slip grip, and that it comes with a hinged filter for easy cleaning. It’s attached to a five-foot power cord that helps you maneuver easily around the bathroom or bedroom as you dry your hair. The Conair 1875 makes it easier to get a faster blow-dry without damaging hair or making it difficult to style. It doesn’t feel heavy in the hand but packs a powerful drying punch. There’s more to using a hair dryer than turning it on, pointing it at your head, and moving it around your scalp until your hair is dry. That’s not to say you’ve been using your dryer incorrectly, but there are a technique and routine for drying your hair that professionals recommend. Drying your hair when it’s too wet means you’ll risk damaging it because you’ll need more excessive heat to dry it. Instead, dry your hair when it’s damp. A quick rub of your hair with a towel will help get you to the dampness stage, but don’t overdo it with the towel. To get more comfortable, get a good robe too. 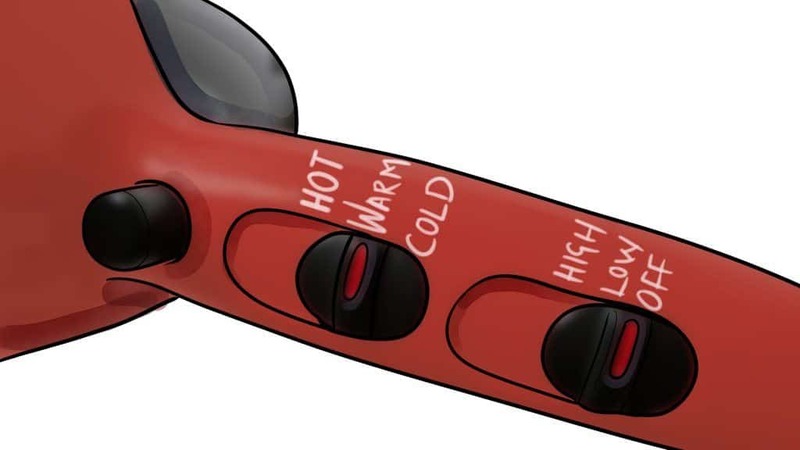 Good hair dryers come with heat settings that allow you to adjust the heat depending on the wetness of your hair. More heat typically means a faster drying job but here’s the thing – you don’t want to expose your hair to an overload of intense heat because you may end up damaging your hair. So, what is the correct amount of heat? Some experts advise that you use the lowest heat you can manage while still drying your hair in a reasonable amount of time. It’s not overly important that you start at one of the segments or follow a specific order, but the goal is to cover each segment at least a couple of times until each of them is dry. 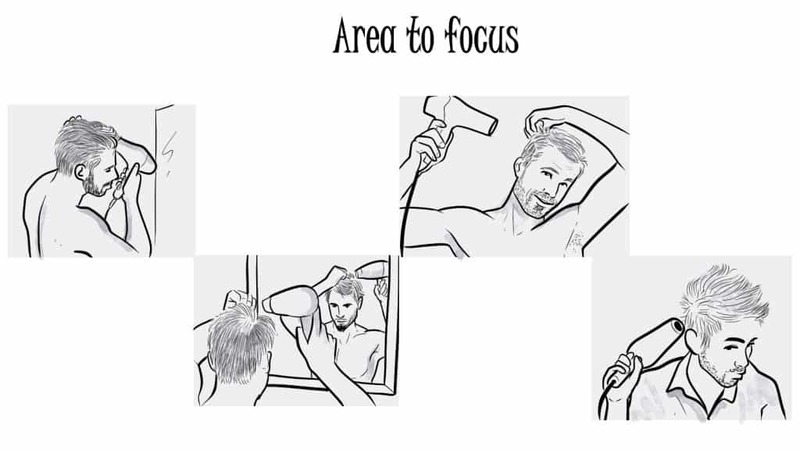 Concentrate on each area for five seconds at a time; any more than that runs the risk of damaging your hair. Another question is how dry is dry? Some professionals say that drying your hair until there’s not a drop of moisture left means that, A) you’ve exposed your hair to too much heat, and B) you may end up with a style that looks like straw, tumbleweed or has too much frizz. Leaving a small amount of dampness isn’t a bad idea. 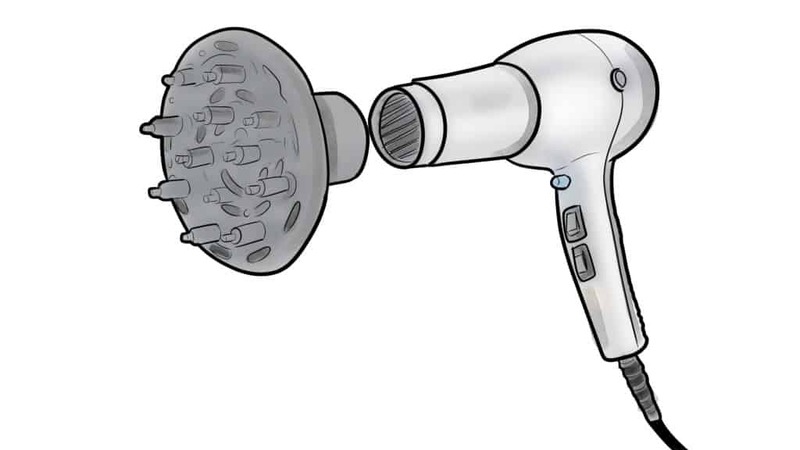 Attaching a diffuser to your hair dryer aids the drying process in a couple of ways. For one, it directs the heat over a larger area of your head than it does over without a diffuser which, in turn, decreases the risk of damaging your hair while speeding up the drying process. Diffusers aren’t as effective when you’re trying to style your hair or enhance a style you already have in place. Also, use a lower heat setting when using a diffuser. If your dryer doesn’t come with a diffuser, you can always buy one separately that fits your make and model. Drying your hair means drying it from root to tip and not just the surface that’s visible to you and everyone else. Simply drying your hair in the direction of your particular style isn’t the best method. Instead, you should follow a couple of techniques: dry your hair at its roots in the opposite direction of where your hair naturally falls (if you part it to the right, blow it out to the left). 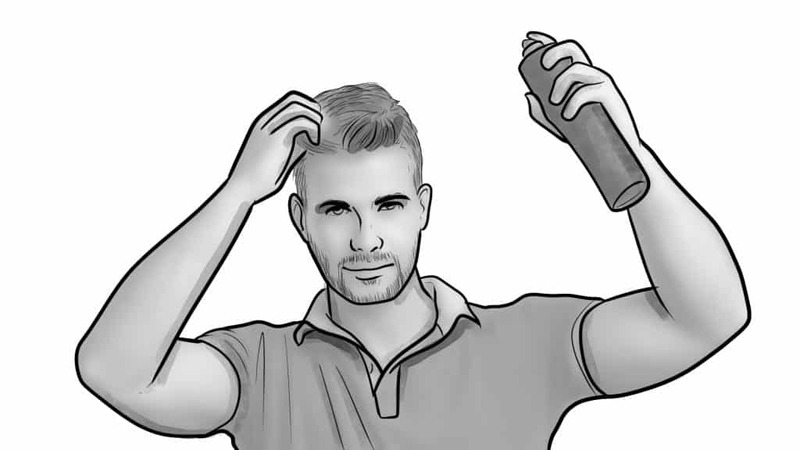 For the ends, however, blow in a downward direction toward your style for maximum smoothness. Never put the dryer’s nozzle too close to your hair because the intense heat can cause damage. Instead, keep the dryer about 6-inches from your hair while moving it from segment to segment. It’s never wise to use a metal brush while drying your hair because the metal can get too hot, too fast and cause damage to your hair. Instead, use a brush made of nylon, boar’s hair, ceramic, or a combination of all three. Spraying your hair with a hair protectant product can help limit damage to your hair caused by the dryer’s intense heat. Up to this point we’ve talked a lot about hair dryers without saying a whole lot about why you should use them. And why not just towel dry your hair and let it dry naturally once you’ve combed or brushed into your preferred style? It’s a good question – indeed one worthy of a closer look. While drying your hair may add a couple of extra minutes to your routine, it’s time well-spent because it sets the foundation for the kind of styling that you’d like to present to the world. It helps you realize how much potential it has. While a dryer won’t grow hair or change it to a different color (ah, but if only), it will help you style in a way that represents your true desires. Having trouble achieving that style you’ve always wanted? Then get used to using a dryer. A brush and a hair dryer, as mentioned, combine to set your hair in the place where you want it to go. Furthermore, when your hair is dry it naturally falls back into the general shape of where you dried it, meaning you don’t have to use as many styling products (hairspray, gels, etc.) as you would normally. Besides, many products such as pomade and paste work best when applied to dry hair. 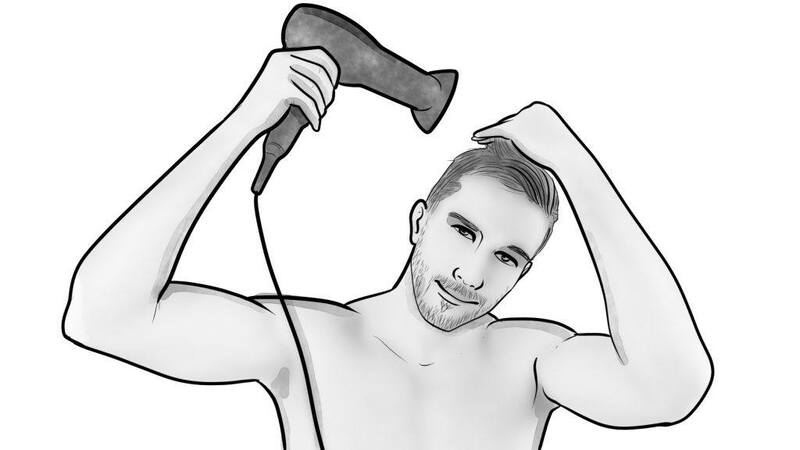 OK, so a hair dryer saves you time and helps you style your hair into the shape you want. But doesn’t it damage your hair? The fact is, using a hair dryer properly, i.e., at the right distance and temperature – causes less damage to your hair than other methods. Why? Because the longer moisture stays on your hair the more your hair swells. And the longer it swells the more pressure it puts on proteins that keep hair intact, which can lead to more damage than if you hadn’t dried your hair. Towel drying your hair is OK – to a point. It’s not a bad idea to give your hair a quick towel rub after you’ve emerged from the shower because you don’t want to blow dry your hair when it’s completely wet (because that means you’ll need to expose your hair to heat for a longer period). But aggressively towel drying your hair, in which you dig into your hair and scalp as if you’re putting out a fire leads to split ends and hair breaks. Don’t do it. Again, don’t rub your hair with a towel with too much force. In fact, don’t even rub the towel over your hair but press it down firmly to remove excess moisture. Aggressively rubbing your hair with a towel is a tough habit to break, but breaking the habit means less breakage in your hair. Only use a towel that’s clean and soft to dry your hair. Towels with any type of texture may damage hair when you press too hard. Hair experts recommend using quality conditioners after you shampoo your hair and before you towel dry it. You may even want to use a leave-in conditioner, or stick with one that you wash out after you’ve applied it to your hair. Conditioners smooth hair cuticles and creates healthier-looking hair. Don’t forget to use a high-quality shampoo, as well. Craftsmanship and construction – No one wants to buy a cheaply-made dryer that’s going to die several months after they bought it. Durability is important, especially for something you may use daily. Attachments – We like dryers that come with a variety of attachments, such as diffusers, that provide versatility. Price – We seek to find products that fit into a variety of price ranges that fit the budgets of every man. Ease of use – Is the dryer easy to use, even if it comes with a variety of gadgets? Its buttons and attachments should be intuitive, not the stuff of rocket science. 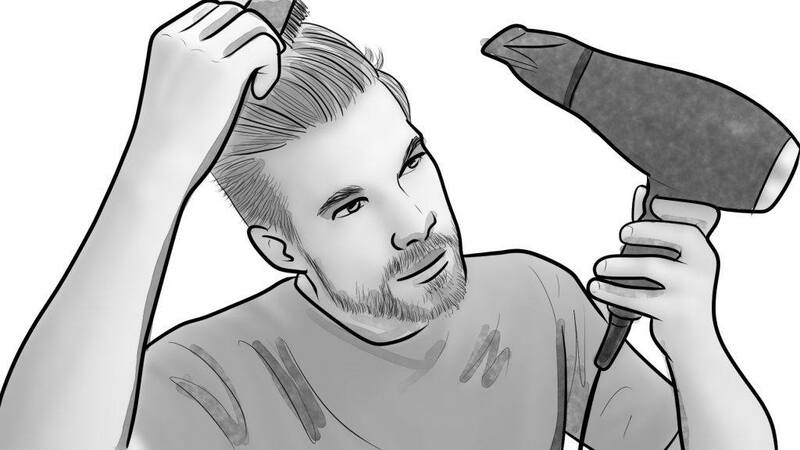 That wraps up our review of the best hair dryers for men in 2019. Have you used any of the dryers listed here? Is there another dryer that’s your favorite? We always welcome your comments and suggestions. 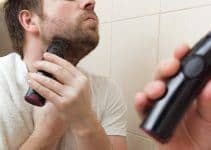 7 Best Natural Deodorants for Men That Actually Work!